This past weekend I officially am a 20-something with no exciting birthday's left in my future. When you're young, they're all incredible. Double digits, Teenager, Sweet-16, Driving, Voting, Drinking, and the last milestone is Renting a Car at 25. But now... what do I have? 30. 40. Over the hill. Retirement? Sad. Very Sad. It's also another well understood fact that once you're in your mid to late 20's the rowdy college appropriate parties are supposed to slowly be replaced by a little more sophisticated and grown-up shindig. So I figured with this being my last hurrah and all, I'd go out with a bang. A drunken goat bang! And with my new found love for fondant, I decided it'd be the perfect time to start putting my ideas into practice. So with that, let me present my attempt at what will hopefully be a long future in cake making! 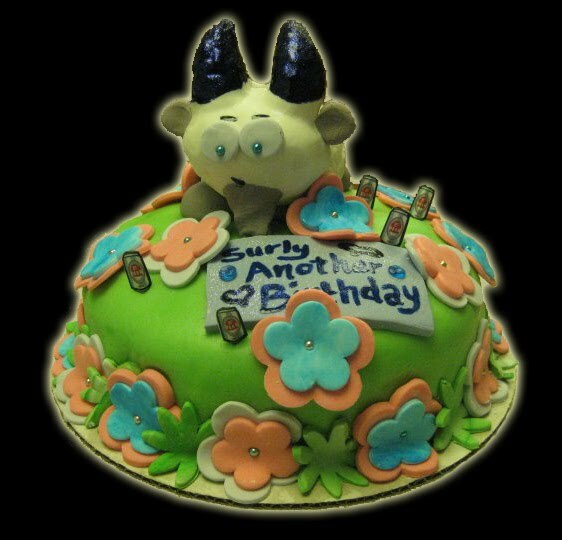 FYI the goat isn't pure fondant, my brilliant co-worker Myleen suggested I make a rice krispy treat goat & then cover it in frosting. That way it was sturdy enough to stand upright, and light enough to sit atop my funfetti cake! The Flowers / Leaves. I also knew I wanted little flowers with dragonee (or whatever you call those little silver balls) centers. In coloring the fondant, I noticed that it actually looked much cooler when the color was "rolled" in, but not all the way. Thus creating the textured feel to the flowers. I cut & put them together a few days before and kept them refrigerated as well. The Cake. I rushed home Friday night & threw my box funfetti cake in the oven. There was no time for creativity, but Betty Crocker always comes through! I also used funfetti icing as the fill layer and to frost the outside before lying down the fondant topping. The Grass. Borrowing my co-workers mat & PVC piping, I worked the rest of my homemade buttercream fondant into a green sheet to fold on top. It's a little softer, but a lot tastier. The Beer Cans. In my original conception of the cake, I had wanted these awesome beer and champagne candles I'd seen months ago at the grocery store. But I failed in ever finding them again... so as a substitute, I printed pictures, glued them to toothpicks and stuck them in at random.